Vale started well and with only ten minutes on the clock Chris McKenzie’s ferocious shot was turned behind by keeper David Markey. But from the resultant corner the cross found Gary McMenamin at the back post who beat the keeper with a looping header to give Vale a deserved lead. Rossvale had an escape when Jamie Henderson sent an excellent cross into the box and Paul Hewitt, unsure whether to head it or kick it, finished up missing the ball from close in. Only a brilliant Donnelly save from Henderson kept the home side in front, but on 25 minutes the teams sides were level when Hewitt won the ball in midfield and lashed a terrific shot past Donnelly. Rossvale lost control of the game for a spell, but soon got back on top when Matt Niven won the ball deep in his half, ran to halfway and spread the ball out to McKenzie who beat his man and fired in an unstoppable shot from an angle at the edge of the box which gave Markey no chance. 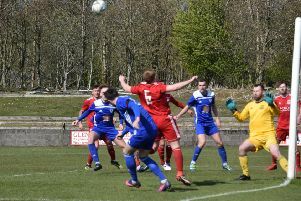 With their noses in front Vale picked up their game again and Andy Johnstone was unfortunate when he cut in from the right and unleashed a shot which crashed off the crossbar. Chris Duff then tried his luck from outside the box only to see Markey bring off another excellent save. Just before half-time Hewitt tried his luck also from just inside the Vale box. Donnelly was equal to it but the rebound landed at Robert Love’s feet and all he had to do was prod it into an empty net to square the match again. The second half was goalless and in the end a draw was possibly fair. Other results also went their way, meaning no ground was lost in the race for third by Rossvale who are away to Whitletts on Wednesday before travelling to face Championship leaders Rutherglen Glencairn on Saturday.